My guild has finally taken down Argus Mythic! Hurray! I even managed to catch it on video, so everyone can enjoy watching our very, very messy kill. It may look like we were on the verge of wiping, but we knew we had it all along! Such a pristine, clean kill. Executed with a clear-headed and calculated precision. Near perfect, I’d say. We were around wipe 480+ when we finally got the kill, after quite a few sub 10% wipes, including one on 0.8% (that was a happy moment – not). We have been at it for weeks, so I’m happy he’s dead and we can finally relax and do some casual reclears. I think everyone needs to recharge their batteries for Battle for Azeroth. Here is a clean version of my personal notes from Ursoc mythic encounter. If you want to add any knowledge or help other players with the encounter, feel free to comment and discuss below! Urosc charges the player affected by Focused Gaze after 6 seconds. The further away the player is from Ursoc, the less damage the player takes by Trampling Slam. When he hits the player, the raid takes damage by Barreling Impact, which does less damage the more players are standing in it. Players hit by Barreling Impact get the Momentum debuff, which means they can’t always help soak the Impact. Split the raid into two groups and let them rotate to soak Barreling Impact! The raid should soak the damage of Roaring Cacophony together by standing close to Ursoc when he casts it. Never stand in the Miasma patches that are left behind. Roaring Cacophony does more and more damage each time he casts it. Barreling Impact also deals high damage. High tank damage. If the two tank debuffs (Overwhelm and Rend Flesh) aren’t handled properly, the tanks will die. Roaring Cacaphony and Barreling Impact are physical damage, Diffuse Magic does not help. Consider Dampen Harm. At 30%, Ursoc enrages and you enter the burn phase (Blood Frenzy). Yesterday, my guild finally took down the last boss of the Emerald Nightmare, mythic. And I actually remembered to record this time! Hallelujah! So, if you’re interested in seeing the kill or having a look at my current healer UI, it’s now at your disposal here or at YouTube. Emerald Nightmare has definitely been fast-paced and, from the context of things, rather brief. Part, because EM seems to be a soft start to Legion (it has been indicated that it’ll be a rather long expansion), and hasn’t been the most challenging raid. Probably because tiers doesn’t drop from the raid and no one started with a fully fleshed-out Artifact. I have a feeling that Nighthold might give us more to chew on. Here are my personal notes from my progression on Mythic Nythendra – or at least the cleaned-up version of them. The original notes had more colorful language, spelling mistakes and abbreviations until oblivion. But now they’re legible – hurray! Infested debuff stacks inevitably during the fight and is cleared at Heart of the Swarm. If you have 10 or more stacks of Infested, you will be mind-controlled after Nythendra casts Infested Mind (which always happen directly after casting Infested Breath). Stack up before the cast so that non-mc people can dish out enough damage to break the mc. Do not use Leg Sweep since debuffs remain even after MC. The mind-control is easily broken though, so Spinning Crane Kick is fine. Try to stagger MCs so that you always have enough people to break out affected players. This sometimes mean that you have to stand in puddles to accumulate stacks on purpose. Raid leader should keep an eye out on how many will get mind-controlled. 3rd MC is critical since Rot will be cast about the same time. Spread directly after MC is broken. Stand at least 8 yds away from allies when affected by Rot. When expired, green patch will spawn beneath you. Put puddles at the edge of a room at a designated location. Use a Health Pot to heal while running out with Rot unless you can cast an emergency heal during or before the run. High-ticking damage! Don’t stand close to the affected tank when Volatile Rot explodes. It’s raid-wide damage, but the closer to the explosion the more damage it does. 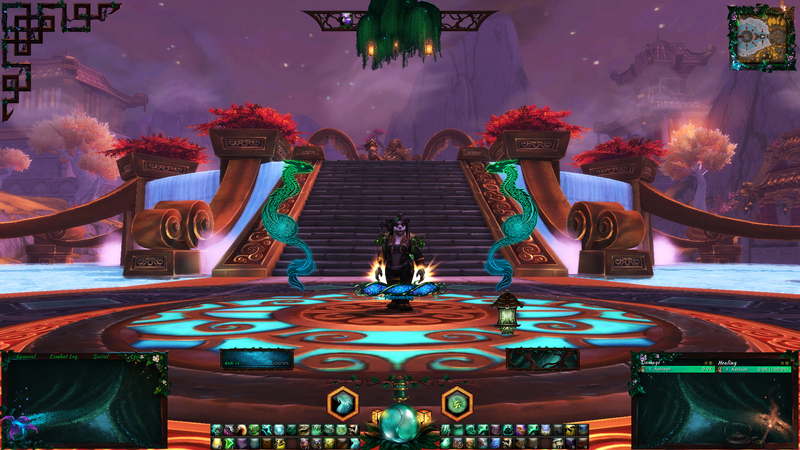 Mythic Emerald Nightmare has been opened for less than one lock-out and the world-first race is already finished! Celebrations and congratulations to the winners, good job! The rest of us are just trying to catch up now. Oh, and I’ve updated my Gumroad with the Patreon reward package from August; Zen UI! My artistic journey continues! Thank you for supporting me by buying my art – I hope you find interface art just as exciting as I do!